Iva Bittová presents a program inspired by our music heritage, which also concludes her Bachelor studies at the Academy of Ancient Music in Brno. Wednesday 13 May 2015 19:30 — Convent of the Brothers of Charity, Vídeňská 7, CZ–63900 Brno, Czech Republic. Iva Bittová decided three years ago to delve into the discovery of the style and repertoire of what we today denote “early music”. In Brno you can study the theory and performance practice of early music at two schools — either as full-time study at the newly created Department of Organ and Historical Interpretation of the Janáček Academy of Music, or as distance study at the Academy of Ancient Music of the Institute of Musicology at the Masaryk University — and this since 1991. Today’s graduation concert closes her Bachelor studies at ASH. 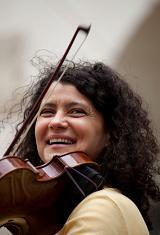 Her teacher for singing was Associate Professor Vladimír Richter, she studied Baroque violin with Eleonora Machová. We thank Igor Šeda for help with the illumination of the concert hall.